The Global Smart Connected Washing Machine Market was valued at $3,712 million in 2016, and is projected to reach $13,631 million by 2023, growing at a CAGR of 22.60% from 2017 to 2023. Washing machines are home appliances used for washing laundry, as they save time and energy. A smart connected washing machine operates by connecting to the internet using the household Wi-Fi, thereby enabling the user to get real-time information about the washing along with remote access & control. Numerous technological advancements have been carried out in these washing machines during the last decade, leading to their higher efficiency, in terms of saving water and electricity. This in turn makes the smart connected washing machines more lucrative to consumer, as they help in cutting down the cost and effort of doing laundry. 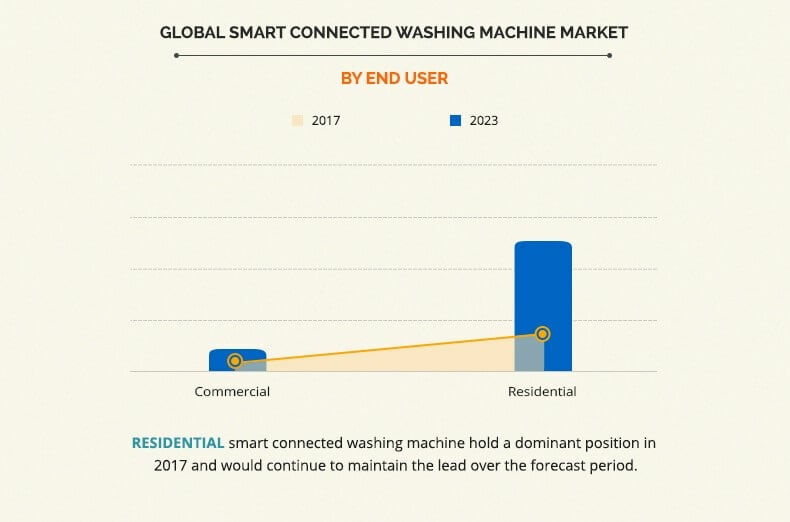 Increase in use of Internet of things (IoT) and rapid urbanization drive the growth of the global smart connected washing machine industry. Moreover, rise in disposable income of people and increase in efficiency of smart connected washing machines such as use of less electricity and water are expected to boost the market growth. However, the availability of laundry shops and growth in online laundry services hinder the growth of the market. On the contrary, technological and innovative advancements related to smart connected washing machines is anticipated to provide lucrative opportunity for the manufactures operating in this market. Global smart connected washing machine market is segmented on the basis of product, end user, and geography. By product, the market is categorized into top load and front load. Based on end user, it is bifurcated into commercial and residential. Geographically, it is analyzed across North America, Europe, Asia-Pacific, and LAMEA. Major players analyzed in this report are Samsung Group (South Korea), LG Electronics Inc. (South Korea), Siemens AG (Germany), Haier Group Corporation (China), AB Electrolux (Sweden), Whirlpool Corporation (U.S.), Robert Bosch GmbH (Germany), Techtronic Industries (U.S.), Panasonic Corporation (Japan), and GE Appliances (U.S.). 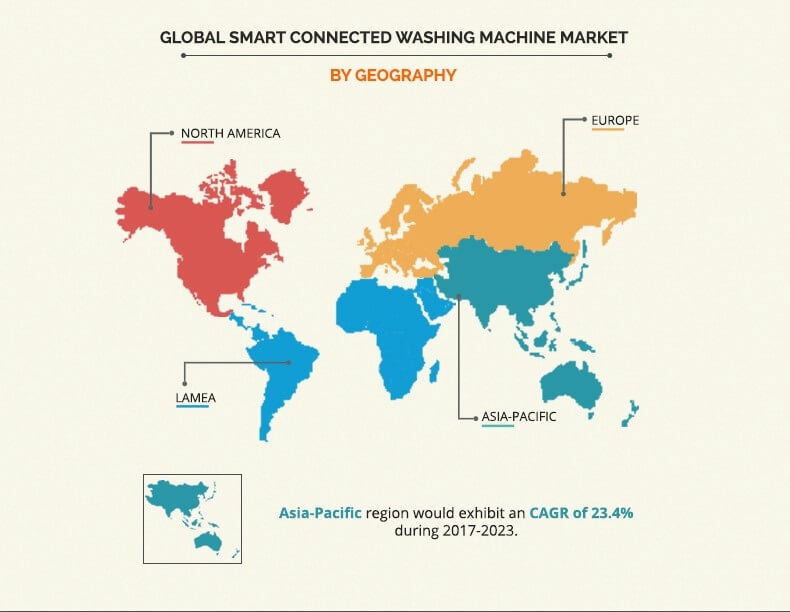 The Asia-Pacific smart connected washing machine market witnessed a rapid growth, as smart connected washing machines have gained popularity owing to their compatibility and user-friendliness features. In addition rapid urbanization and an expanding middle-class population drive the market growth. Moreover, less availability of time for laundry due to hectic lifestyle fuels the demand for smart connected washing machines. Front loading smart connected washing machine holds a large market share as compared to top loading smart connected washing machines, and is estimated to be the most lucrative segment during the forecast period, due to high consumer preference, lesser human intervention requirement to operate it, higher energy & water efficiency, and improved stain removal ability. 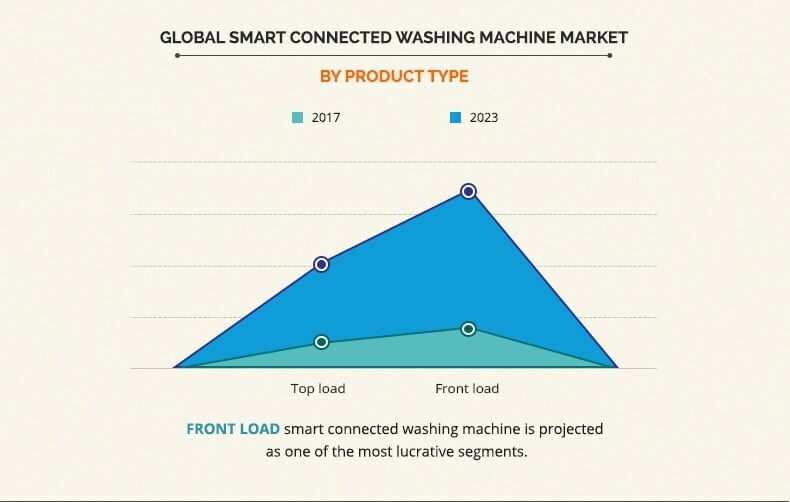 The residential segment is expected to dominate the smart connected washing machine market throughout the forecast period, as these smart connected machines have gained high preference among residential consumers, as they have prefect laundry washing capabilities for most residential users globally. In addition, the machines significantly save electricity as compared to other washing machines. The study provides an in-depth analysis of the smart connected washing machine market with current trends and future estimations to elucidate the investment pockets. 7.7. Samsung Electronics Co. Ltd.
7.9. Techtronic Industries Co. Ltd.
Smart connected washing machine is a laundry washing appliance, which is widely used to save time and energy required to do laundry. Washing machine is generally viewed as a necessity goods rather than a luxury good, due to increase in urbanization. Economic growth of various countries across the globe has contributed to growth of the smart connected washing machine market. Depending on the customer preference and requirement, different types of smart connected washing machines are available in the market such as top load and front load. Furthermore, depending on the end user, the industry offers commercial and residential washing machines. The smart connected washing machine further helps in assisting the user in case of machine malfunction. These machines offer a user-friendly interface and are highly efficient, which fuel their adoption, thereby boosting the market growth. Moreover, multiple washing machine models are integrated with self-cleaning elements, involving soaking the laundry for longer time and then high-speed spinning to clean them without the use of chemicals. Sixth sense is another innovative technology used in smart connected washing machines. Various energy-efficient standards are imposed by various government and environmental regulatory bodies on washing machine manufactures. Thus, manufactures are seeking for smarter ways to make their product energy efficient. Manufactures such as Speed Queen, Maytag, and Whirlpool focus on developing heat pump-powered dryers rather than the conventional electricity and gas dryers. Heat pump dryers are 30% more energy efficient than traditional dryers. Residential washing machine brands such as Whirlpool, LG, Electrolux, and Haier are significantly investing on water-saving capabilities of washing machine. "Smart Connected Washing Machine Market"